I’ve been catching bits and pieces of the Winter Olympics. The skill, devotion and bravery of the athletes are inspiring. All the same, I’m considering a change that I think would make the games more enjoyable to watch. Yes, he makes it look easy. He knows what he is doing. Where is the challenge in that? I was watching the Ski Jumping competition and marveling at the calm displayed by the competitors as they competed in what must be the most counter intuitive sports ever devised. Consider what these people do. They ski down a ramp with a precipitous drop at the end. They fight the instinct to slow down and ease over the drop, instead allowing momentum to launch them toward a landing point far below. Additionally, to maximize their distance, they lean forward over their skis, essentially facing the onrushing frozen ground. There are no flailing arms, no terrified screams, no sobs of relief at the bottom. You see, the real problem with the games is that all the right people are competing. What if there were competitors in the Ski Jump who had never participated in the event before? Bobsledders who had never seen ice outside of a glass? Figure skaters who had never worn sparkly clothing? There is a place for skill, daring, grace and the practiced precision of the athletes who have trained for years to represent their nations. Those people should never have their day in the sun (or snow, as the case may be) stolen from them. Perhaps there should be a place, side by side with those people, for the talentless, fearful, clumsy and slothful among us. In that spirit, I propose a few options that would radically change the Olympics while keeping their spirit and increasing viewership of the games. My proposals are based on the principle of an Olympic draft. As the Olympics approach, nations would continue selecting their best athletes in each event. At the same time, they would also have an equal number of their citizens drafted by the International Olympic Committee as Drafted Athletes. Drafted Athletes would be randomly selected from the entire population. Their expenses would be covered by the nation they represent and they would be expected to compete unless there was a clear and compelling medical reason that precluded it. What do you mean "I hope I don't miss"? The drafted athletes would compete in events that they had no actual experience in. They would not know they were going to be a Bobsledder, a Biathlete or a Hockey Player until they arrived at the host city and were given a uniform. 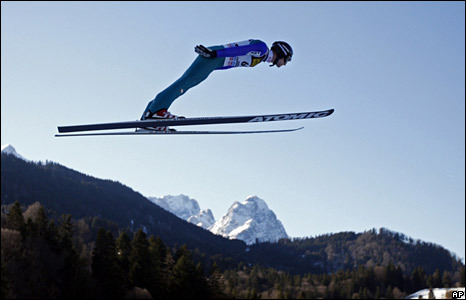 Picture the bravery of the well-trained ski jumper contrasted against the screams of the drafted ski jumper. I’d leave it up to the IOC as to how to fit the drafted athletes into the games. Perhaps there would be competition among the drafted athletes immediately following that of the skilled athletes. Maybe the better solution would be to intermingle the drafted athletes with the skilled ones. What if an inspiring pairs figure skating performance was followed by a performance by an accountant and her partner, an electrician, who just met backstage where they were given skates and matching sequined outfits? As a bond building step between the skilled and drafted athletes there could also be combined medals added to the games. For example, the time of the trained bobsled team from each nation could be combined with those of the untrained teams. In the end, the final choice of how to implement this idea is going to be up to the International Olympic Committee. I can’t do everything for them. I’m handing them a good idea. It is up to them to run with it. Oh sure, you’ve got to look the part to be successful. Keep in mind though, some of the drafted people will be getting spandex! I’m imagining bobsledders in sparkly outfits and it’s not a pretty sight. I’m thinking there are going to be a lot of people who look completely inappropriate in their uniforms. Of course, that will be part of the charm. Just in case your ideas ever come to fruition, I’m inspired to get into better overall shape…I wanna be drafted for the Summer Olympics though so I can be considered for the uneven parallel bars competition. Can you just see that? I know, you’ve been wondering that about me since Junior High. Be careful. You’ve got an equal chance of being selected as a shot putter. Yes – I’m all for the spirit of Eddie the Eagle living on! Oh God, I’d forgotten him. He is exactly the kind of person I’d want drafted. thought – take out large soft landing area on ski jumping, replace with flamming circle to jump through. I would be immedietly sold. I like that! With that, the jumpers have something at stake. I like the sound of the flaming circle. It gives the event a circus quality, no? I have to say the concept of drafted athletes reminds me of Jury service. You can’t get out of that either without a very good excuse. I can skate a little so that disqualifies me from the skating events. Mind you, I really struggle with hockey skates, so maybe I’m back in with a chance. I watched the ski jumpers last night with admiration, but through my fingers. That and the Luge are perfect screamers for the drafted athletes, but who would clear up the fluids that are bound to be expelled in response to such terrifying events? I’ll be dead before I’m put into anything spangly. I’m British, you know. We don’t do that sort of thing here. It does, and given that there is always a torch handy, it can always be relit. Jury duty is a perfect analogy to the athletes draft. You get the word, you show up. I think part of the preparation for most events would have to be making a pit stop at the top of the hill to prevent unfortunately stained spandex at the bottom. An enema would therefore be required. It’s the only way. The sponsors would demand it. I’ve often wondered what it would be like to fly down that gigantic ski jump. I’ve always assumed I’d go about 12 feet, land hard and die. I wanted to be the first to mention Eddie the Eagle. Dang it. I myself would like to be drafted for curling, because I think you could curl while drinking and smoking, like my other favorite sport, bowling. I say if you can drink and smoke during the execution of your chosen sport, it’s a crappy sport. Ok, but dont forget, in the draft, you could also end up as a snowboarder.